Acne is a chronic, inflammatory skin condition that occurs at the sites of oil glands in face, chest, shoulders and back. Acne lesions include whiteheads, blackheads, small bumps and nodules. 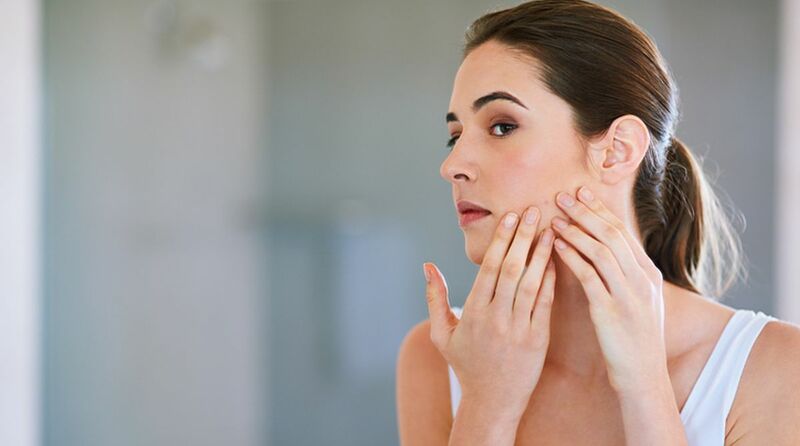 Sensitivity to hormones, combined with bacteria on the skin and fatty acids within oil glands, cause acne. Acne is not dangerous, but it can leave skin scars. When you are suffered badly with acne that scars your skin, it may affect your self-esteem. There are a number of good natural treatments to remove these scars. Garlic: Due to the presence of natural antibacterial, antifungal and antiviral properties, garlic can treat and reduce acne scars effectively. Crush a garlic clove to a paste like consistency. Add two teaspoons each of honey and olive oil in it. Apply this mixture evenly onto your skin after washing your face with warm water. Leave up to 15-20 minutes. Rinse off with warm water. Repeat thrice a week. If you notice any burning sensation, rinse immediately and use less garlic the next time. Onion extract: It is a proven treatment for acne scars. Onion extract has antimicrobial and anti-inflammatory qualities. Apply its mask to cure acne marks. Peel a medium-sized onion. Grind it to a fine paste along with two tablespoons of soaked oatmeal (soak oatmeal in hot water for 10 minutes) and one teaspoon of honey in a food processor. Apply this mask on your face. Leave for 10 minutes. Rinse with warm water. Repeat thrice a week. Aloe Vera: Besides soothing the skin, aloe vera helps regenerate the damaged tissues by boosting the healing process. Wash your face thoroughly. Apply aloe gel on the scars so that it coats thin layer of gel on the skin. Let it dry. Rinse off with normal water. Repeat daily for fast result. Cucumber: Cucumber is very effective for both preventing acne and fading acne scars. Take a fresh cucumber. Cut it into fine slices. Refrigerate the slices for three hours. Then put these slices on affected areas and leave for 15-20 minutes. After removing rinse off with warm water and then cold water. Repeat every day. Lemon juice: Mix well equal parts of lemon juice, rose water and cucumber juice. Apply this solution all over your face. Rinse off with cold water after 20 minutes. Repeat this every day for fast result. Lemon juice is high in antioxidants and natural citric acid, a form of vitamin C. It has antiseptic qualities and can reduce redness and inflammation that may help treat inflammatory acne as well as leftover scars. Apple cider vinegar: Apple cider vinegar contains the acids which may help reduce the appearance of scars by removing the damaged, outer layers of the skin and promoting regeneration. But never apply it directly to the skin as it can cause burns. Always dilute it with water and apply in small amounts at a time. Do not apply on open wounds or sensitive skin. Mix one part of apple cider vinegar to three parts of water. Apply this solution on clean face. Let it sit for 10-20 seconds or little longer if it does not irritate your skin. Rinse with water. You can repeat the process once per day until you see results. Essential oils: Essential oils work by regenerating the skin cells of damaged skin and thus help reduce the appearance of scars. They balance skin tone and reduce redness and inflammation. The list is long – rosehip seed oil, vitamin E oil, frankincense oil, geranium oil, lavender oil, carrot seed oil, tea tree oil, almond oil, cedar oil, coconut oil and many more. The antioxidant and anti-inflammatory properties help to prevent and heal this chronic condition. They help the skin to retain the moisture and soften the skin. Egg whites: Egg white can powerfully heal your scaring and eventually make it less visible. Being rich in proteins and amino acids, it tightens the pores to prevent new breakouts and also lightens the scarred skin. Whip two egg whites until they become fluffy and white. Gently spread it on to your face concentrating on the problem areas and let it sit until dry. Rinse with lukewarm water. Repeat thrice a week to get rid of scars. Baking soda: Baking soda gently sloughs off the top layer of dead skin cells without causing any harm to your sensitive facial skin. Mix baking soda with water to make a paste like consistency. Massage it very gently on your face. Leave for two to three minutes. Rinse off with lukewarm water. Always moisturise your skin afterwards with olive oil. Repeat thrice a week for effective results. Honey: Honey is an excellent antiseptic which greatly diminishes any sort of inflammation. Its antioxidant content aids you in dealing with current pimples, but it also helps to support your skin as it heals itself. Honey feeds your skin with its various minerals and vitamins. The antibiotics in honey guard your skin from various acne-causing germs. Try to use raw honey rather than the processed one, as the latter has less beneficial nutrients. Apply honey on your clear skin. Let it sit for 15-20 minutes. Rinse off with lukewarm water. Repeat regularly for fast results. Acne scars are basically the long-lasting after effects of your short-lived breakouts. They are often worse than normal pimples. The best way to avoid scarring is to treat acne with a great skin care routine and that means you need to resist picking, poking or touching a pimple. Aside from genetics, there are several lifestyle habits that can make dark marks and scars worse. Spending time in the sun is a big one, and to reiterate again, every dermatologist agrees that pricking or squeezing pimples creates further inflammation and can ultimately lead to more damage. The dark acne marks left behind by pimples ultimately fade. The discolouration from dark marks will usually fade overtime, but these easy home solutions will help speed up the process.